Canada, in the eyes of many of its citizens, as well as those living elsewhere, is imagined as a beacon of tolerance and diversity. Seen as an exemplar of human rights, Canada’s national and international reputation rests, in part, on its historical role as the safe haven for the enslaved Black Americans who had fled the United States through the Underground Railroad. Today, it is well known, locally and internationally, as the land of multiculturalism and relative racial harmony. Invisibility, however, has not protected Black communities in Canada. For centuries, Black lives in Canada have been exposed to a structural violence that has been tacitly or explicitly condoned by multiple state or state-funded institutions. Few who do not study Black Canadian history are aware that dominant narratives linking crime and Blackness date back at least to the era of the transatlantic slave trade, and that Black persons were disproportionately subject to arrest for violence, drugs and prostitution-related offences throughout Canada as early as the nineteenth and early twentieth centuries. The history of nearly a hundred years of separate and unequal schooling in many provinces (separating Black from white students), which lasted until 1983, is not taught to Canadian youth. A history that goes unacknowledged is too often a history that is doomed to be repeated. The structural conditions affecting Black communities in the present go similarly under-recognized. In 2016, to little media fanfare, the United Nations’ Committee on Economic, Social and Cultural Rights (cescr) confirmed that anti-Black racism in Canada is systemic. The committee highlighted enormous racial inequities with respect to income, housing, child welfare rates, access to quality education and healthcare and the application of drug laws. Many Canadians do not know that, despite being around 3 percent of the Canadian population, Black persons in some parts of the country make up around one-third of those killed by police. It is not yet common knowledge that African Canadians are incarcerated in federal prisons at a rate three times higher than the number of Blacks in the Canadian population, a rate comparable to the United States and the United Kingdom. Fewer still are aware that that in many provincial jails, the rate is even more disproportionate than it is at the federal level. In addition to being more heavily targeted for arrest, because so much of Canada’s Black population was born elsewhere, significant numbers of those eventually released will be punished again by deportation to countries they sometimes barely know, often for minor offences that frequently go unpunished when committed by whites. Black migrants, too, are disproportionately affected by punitive immigration policies like immigration detention and deportation, in part due to the heightened surveillance of Black migrant communities. Black children and youth are vastly over-represented in state and foster care, and are far more likely to be expelled or pushed out of high schools across the country. Black communities are, after Indigenous communities, among the poorest racial groups in Canada. These facts, along with their history and context, point to an untold story of Black subjection in Canada. 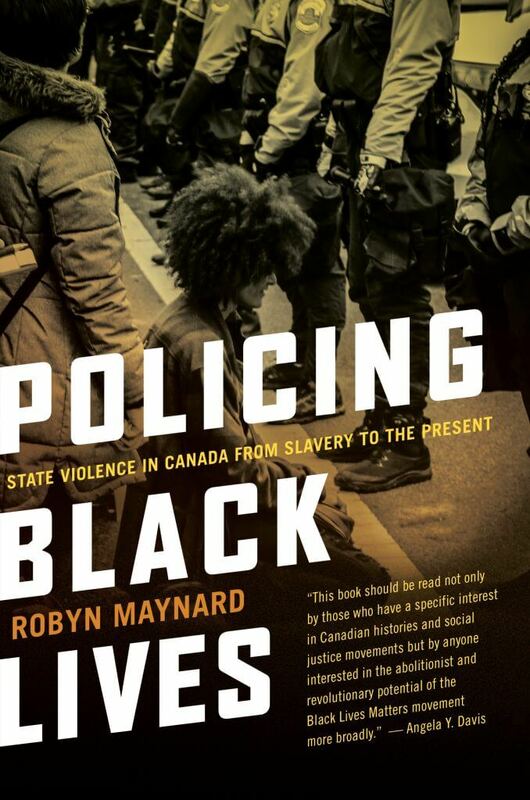 Though anti-Blackness permeates all aspects of Canadian society, Policing Black Lives focuses primarily on state or state-sanctioned violence (though, at times, this is complemented with an enlarged scope in instances when anti-Black state practices were buttressed by populist hostility, the media or civil society). The reason for this focus is simple: the state possesses an enormous, unparalleled level of power and authority over the lives of its subjects. State agencies are endowed with the power to privilege, punish, confine or expel at will. This book traces the role that the state has played in producing the demonization, dehumanization and subjection of Black life across a multiplicity of institutions. I use the word “state” throughout this text to include federal and provincial governments, government-funded programs such as schools, social and child services, and the enforcement wings of state institutions such as the municipal, provincial and national police. The framework of “state violence” throughout this book is used to draw attention to the complex array of harms experienced by marginalized social groups that are caused by government (or government-funded) policies, actions and inaction. This use of the term state violence follows in the traditions of Black feminist activist-intellectuals such as Angela Y. Davis, Joy James, Beth Richie, Andrea Ritchie, Ruth Wilson Gilmore and others who have contributed enormously to studying anti-Black state violence while also actively organizing against it. The state is imagined by many to be the protector of its national subjects. But this belief is a fiction—one that can be maintained only if we ignore the enormous harms that have been directly or indirectly caused by state actions. “Valorizing the state as the natural prosecutor of and protector from violence,” writes Joy James, “requires ignoring its instrumental role in fomenting racial and sexual violence.” It is more accurate to say that the state protects some at the expense of others. The purpose of state violence is to maintain the order that is “in part defined in terms of particular systems of stratification that determine the distribution of resources and power.” In a society like Canada that remains stratified by race, gender, class and citizenship, state violence acts to defend and maintain inequitable social, racial and economic divisions. As such, the victims of this violence have been the dispossessed: primarily but not exclusively people who are Indigenous, Black, of colour, particularly those who are poor, women, lacking Canadian citizenship, living with mental illness or disabilities, sexual minorities and other marginalized populations. Often legally and culturally sanctioned as legitimate, the harms inflicted by state actors are rarely prosecuted as criminal, even when the actions involve extreme violence, theft and loss of life. Grave injustices—including slavery, segregation and, more recently, decades of disproportionate police killings of unarmed Black civilians—have all been accomplished within, not outside of, the scope of Canadian law. Not only is state violence rarely prosecuted as criminal, it is not commonly perceived as violence. Because the state is granted the moral and legal authority over those who fall under its jurisdiction, it is granted a monopoly over the use of violence in society, so the use of violence is generally seen as legitimate. When state violence is mentioned, images of police brutality are often the first that come to mind. However, state violence can be administered by other institutions outside of the criminal justice system, including institutions regarded by most as administrative, such as immigration and child welfare departments, social services, schools and medical institutions. These institutions nonetheless expose marginalized persons to social control, surveillance and punishment, or what Canadian criminologist Gillian Balfour calls “non-legal forms of governmentality.” These bureaucratic agencies, too, have the repressive powers generally presumed to belong only to law enforcement. They can police—that is, surveil, confine, control and punish—the behaviour of state subjects. Policing, indeed, describes not only cops on their beat, but also the past and present surveillance of Black women by social assistance agents, the over-disciplining and racially targeted expulsion of Black children and youth in schools, and the acute surveillance and detention of Black migrants by border control agencies. Many poor Black mothers, for example, have experienced child welfare agents entering and searching their homes with neither warrant nor warning—in some instances seizing their children—as a result of an anonymous phone call. Further, state violence can occur without an individual directly harming or even interacting with another. It can be, in short, structured into societal institutions. This expansive understanding of state violence allows us, throughout the following chapters, to examine the seemingly disconnected state and state-funded institutions that continue to act, in concert, to cause Black suffering and subjugation. State violence is not evenly distributed across populations, but deeply infused along the lines of race, class and gender. These factors play a significant role in the likelihood of one’s exposure to either direct or structural forms of state violence. State violence has historically impacted and targeted different groups of people throughout history to different degrees, according to shifting notions of race, ethnicity, class and ability—or willingness to subscribe to social norms. In the present, it continues to impact differently marginalized groups of individuals. But it is not arbitrary that Black communities are subject to state violence at such disproportionate rates. Black subjection in Canada cannot be fully understood, and therefore cannot be fully redressed or countered, without placing it in its historical context. The endemic anti-Blackness found within state agencies has global and historical roots and can be traced back to the transatlantic slave trade. Excerpted from Policing Black Lives by Robyn Maynard. Copyright © 2017 Robyn Maynard. Published by Fernwood Publishing. Reproduced by arrangement with the Publisher. All rights reserved.